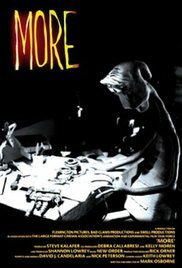 Written and directed by Marc Osborne, 1998’s More is an award-winning stop-motion animated short about an alien being that longs to return to simpler times. Tired of his humdrum existence (which includes working in a factory, where he performs the same task over and over again), our hero finally finishes the invention he’s been working on for years, one that allows people to see the world in a completely new light. This invention proves to be a best-seller, making its inventor rich beyond his wildest dreams. But will his newfound fame bring him the joy he seeks, or simply more emptiness? Save a brief sequence late in the film (when he finally finishes his invention), the animation style in More is bleak and colorless, yet that doesn’t prevent it from being interesting (I especially liked the factory scene, where the lead character is a cog in a machine that never seems to stop running). And while its story of corporate greed and lost innocence is nothing new, Osborne tells it well enough to ensure that its point is driven home. Despite being only six minutes long, More was, as director Osborne put it, an “absolutely massive undertaking” (it took 9 months to shoot the movie), though his efforts weren’t in vain; the film won a number of awards, including Best Animated Short at both the B-Movie Film Festival and the South by Southwest Festival (among others). Chock full of emotion and pathos, More deserved each and every one.